This morning we got a slower start than I wanted, but we did at least still get in almost all of the National Mall and Memorials we wanted to see this DC trip. The only memorial we skipped was the Washington Monument because we did not want to deal with getting the tickets if they even had any to give out, as online showed none available. We started by taking the Metro to Foggy Bottom-GWU. There really is not any Metro close to start on the Lincoln end and on the Washington Monument end has several close options, so it made more sense to start from the far end and work our way to the Washington Monument end and the nearby Federal Triangle station. The Smithsonian Station is also near there, but the elevator entrance is an extra few blocks away and the Federal Triangle elevator entrance is actually closer than the main escalator entrance. We ended up start our walk around the National Mall near the Vietnam Veterans Memorial. We did not walk right by the wall, as we have done that many times before and it was kind of crowded. We did stop at the Women's Vietnam Memorial for some photos, though. 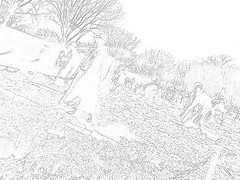 From the Vietnam Memorial we went to the Lincoln Memorial. Here we actually spent some time and went up through the Memorial. We visited the bookstore here, although Mik only went in very briefly because it is so small and hard to move around in his wheelchair even with only a few other people in it. We had forgotten our National Park Passports at the hotel and ended up buying new ones because they had special 25th Anniversary of the National Park Passports versions. They also had a special Lincoln Memorial stamp for the 25th Anniversary. Additionally, they had some stamps for nearby memorials that did not have their own shops, such as Korean Memorial, Constitution Gardens (did not get this one, since we skipped this), and Vietnam Veterans Memorial as well as general National Mall and National Mall and Memorial Parks ones. After the Lincoln Memorial we stopped for a quick lunch at a nearby refreshment stand. 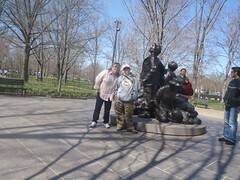 Then we went to the Korean War Veterans Memorial. After this we ditched Mom and Mik and I headed over to the Tidal Basin area. The Tidal Basin was confusing with part of it closed off for the construction of the Martin Luther King Jr Memorial. We ended up going almost to the World War II Memorial to get over to go around the Tidal Basin because the old signage has you cross right where the new memorial is and nothing tells you to cross over earlier. No big deal, as we did not mind having to walk a little extra, as we still got to see the stuff we wanted. The Jefferson Memorial also has a bunch of construction around it with them updating the levee area. It just ruins the outside aspect, but you can still go inside it and see the statue. Of course, all kinds of barricades make it hard to get to the sidewalk area that you can access the memorial without having to squeeze between concrete barricades and walk/roll across a grassy area. The was only because we approached from the East, though, as leaving to the West was where we ended up entering after walking all the way around. 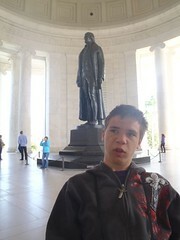 At the Jefferson Memorial, Mik finally got a DC miniature for his miniature collection. He got a White House pencil sharpener. We also got some more stamps in our National Park Passports including the Jefferson Memorial, a 25th Passport Anniversary Jefferson Memorial, and George Mason Memorial. From the Jefferson Memorial we headed over to the Franklin Delano Roosevelt Memorial. 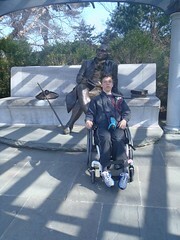 Along the way we stopped at the George Mason Memorial, which Mik had never seem before and is easily skipped. It is actually a pretty cool memorial and his legacy is quite interesting. At the FDR Memorial we got a few more stamps for our National Park Passports: FDR Memorial, 25th Passport Anniversary FDR Memorial, World War II Memorial, and DC World War Memorial (this memorial is under renovation, but we went up to it as close as you can right now). 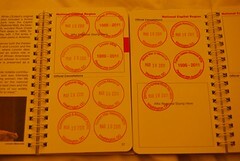 It was fun collecting the stamps and we already have almost 2 pages full of the passports. 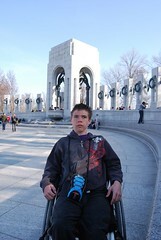 The last memorial we hit was the World War II Memorial. Did not spend much time here, as it was almost 5pm and Mik was tired. Thus we did not even end up walking up and around the Washington Monument like we thought we would. 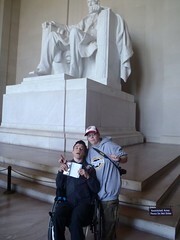 We figure we can easily do that when we go to the National Museum of American History in a few days.